The Holiday Lighthouse Ornament comes ready-to-hang with a red cord and is packaged in a display box. The lobster is a symbol of the New England fishing waters and has become an icon for good food and hospitality. This ornament is made of 24 kt gold finished brass. Our artisans have perfected the art of ornament making. An uncompromising attention to detail and novel approach to design sets this brass ornament apart from many others. 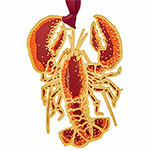 Beautifully handcrafted ornament made in USA from solid brass, 24kt gold finish, with digitally printed color. Packaged in an elegant window showcase box. Dimensions: 3.4" tall x 2.8"wide x 0.25" deep. Weight 3 oz.